To figure out exactly how unhealthy a TV-guided diet would be, researchers studied food commercials that appeared during 84 hours of prime-time programming and 12 hours of Saturday-morning cartoons broadcast over the major U.S. networks during one month in 2004. When the research team calculated the nutritional content of a 2,000-calorie-a-day diet containing only foods that were advertised on television, they found that it exceeded the government's recommended daily amount of fat by 20 times and had 25 times the recommended daily intake of sugar. "That's almost a month's worth of sugar in one day," notes study leader Michael Mink at Armstrong Atlantic State University in Savannah, Ga. In fact, the sources of nutrition in the TV-ad diet were almost the exact opposite of what the government's food pyramid recommends. Instead of making up the smallest proportion of a day's calories, as nutritionists advise, fats and sugars accounted for the largest portion of calories in a diet based on television advertising. Couple this nutritional inversion with the fact that marketing campaigns are notoriously effective in influencing people's behavior and the result is what many nutrition experts call a toxic environment — one that dissuades Americans from making healthy food choices and encourages inactivity. In the year the study took place, the authors point out that foodmakers spent $11.3 billion hawking their products, while the U.S. Department of Agriculture, which oversees national nutritional recommendations, spent only $268 million — 2% of the total that was funneled into food marketing — on nutritional education. What's more, says Mink, advertising campaigns not only skew toward products that are high in fat, sugar and salt but also guide people away from foods that are rich in essential nutrients, such as vitamins and minerals, contributing to a deficiency in many Americans. The 775 foods advertised on TV contained inadequate amounts of 12 essential nutrients — such as calcium, potassium, fiber, vitamins D and E, and magnesium — and provided an abundance of saturated fat, cholesterol and sodium, which can lead to an increased risk of heart disease, diabetes and stroke. The study's findings may not be revelatory to anyone with even a vague understanding of a proper diet, but they do remind us that television and mass-media messages wield great influence over our behavior. They also offer hope, says Mink: if advertising can entice people to choose unhealthy foods, it might also be co-opted to push people toward fruits, vegetables and other natural or less processed options. 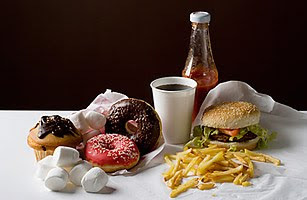 Studies have shown, for example, that past education campaigns that were designed to inform the public about the heart risks associated with diets high in cholesterol and fat and encourage consumers to choose low-fat versions of foods were not successful in getting people to change their eating habits. But when foodmakers started advertising their lower-fat products on TV, their consumption went up. Mink acknowledges that such a fundamental shift in food marketing may not be realistic, at least not now. While many restaurant chains and food manufacturers offer healthier choices, they still highlight their more indulgent and unhealthy products in advertisements. "It's the perennial question of whether these products are being advertised because we want them or because we want them because they are being advertised," Mink says. "Where we come down on it is that it's a little bit of both — and it's a reinforcing cycle. But that cycle can be changed."